I have always wanted to visit London’s famous Borough Market, the perfect place for foodies and keen cooks, but just never managed to find the time on a weekend with so much going on all the time. Even though I live in London, and am literally one tube line ride away on the Northern line, somehow I just could not manage to fit it in to my busy weekends. One Saturday morning, I woke up bright and early and was determined to make the trip to Borough Market to have a look at the variety of produce available and return in time to run other errands and catch up on my blogging. Having lived in London for 11 years it was seriously about time I finally made the effort. I showered, got ready and made my Nestle Nescafe Azera Coffee To Go. I chose the Americano cup and was amazed at how quick and convenient it was. There is also a Latte version which is equally delicious. All you literally have to do is boil water in the kettle, peel back and remove the foil in the cup and fill water up until the line highlighted on the cup and voila! The coffee is ready and portable in its insulated cup. This is so convenient when you are in a rush or want to save some time in the morning. I have been an avid Nescafe Azera drinker for a long time so these new cups are a godsend for me as I am constantly on the go. My usual routine in the morning would have been to make a mug full of coffee, climb back into bed and go through my twitter feed and schedule some posts for the day, while scrolling down Instagram and Facebook to see what was going on or what I had missed. I can easily spend an hour doing this! Instead I grabbed my handbag and coffee and headed on to the tube, enjoying sipping my coffee until we got to London Bridge and walked towards Borough Market. It was amazing how quiet the tubes were at 7:00am on a Saturday as opposed to a weekday and I really enjoyed the blissful journey with my coffee. It was actually so liberating not to be staring at my phone screen and instead just enjoying the time and coffee. The walk towards Borough Market was so lovely and it was a bright day. I couldn’t help pausing to take in the views of Tower Bridge. It was surreal to see the city of London without its usual hustle and bustle and swarms of tourists. It was so worth it for the view! We then continued walking to Borough Market, which was very quiet when we arrived which was fantastic as we got to spend some time walking around to see what was available, as well as chatting to various vendors. Looking at all the different fresh produce and products I was inspired to buy some different ingredients to my usual ones and cook an Italian meal for dinner. My absolute favourites were the different coloured tomatoes and I bought some, along with some asparagus, carrots, shallots, spring onions, chillies, garlic, olives, pesto and cheese, from the various vendors. The vegetables were all organic and the pesto was additive free. As it had been quiet, we managed buy what we needed quickly with no queues to pay and unexpectedly saved even more time. We took advantage of this by walking around and managed to get some closer views of Tower Bridge and an actual seat by the fountains. The views were amazing and not obstructed from crowds of tourists, as you would probably face if you were here later on in the day. The morning itself was lovely, which is rare for British Summer, and it was fantastic to be able to take a moment out of the day to enjoy London with my Nestle Nescafe Azera Coffee To Go in hand. The coffee had stayed warm through most of the journey so I could still enjoy some sips of it. The prices of the Nestle Nescafe Azera Coffee To Go are so reasonable and it is so much better than getting a takeaway coffee from a mainstream coffee shop. If you would like to try some you can purchase them here. In each Nestle Nescafe Azera Coffee To Go box you get 4 cups and lids. You save so much time too as you can make the coffee at home and carry it with you so there is no need to wait in early morning queues to get your caffeine fix! Plus it tastes incredible which is a major plus point. We had an equally quiet journey home and I then carried on with the rest of my day’s tasks before preparing dinner in the early evening. It was so exciting to use all the new vegetables I had purchased earlier and I put the pasta to boil in a large saucepan whilst I prepared the vegetables. From my Borough Market haul, I used the tomatoes, chillies, shallots, spring onions, garlic and asparagus. I chopped them and then sautéed them in a pan in some olive oil. Once the pasta was ready, I drained the water and re-added the pasta to the saucepan. I added the sautéed vegetables, the pesto I bought earlier and some salt and pepper. I mixed everything thoroughly on low heat and the aromas coming from the saucepan were making my stomach rumble in anticipation. The final garnish was freshly grated cheese and the olives sliced in half. I plated it up and here it is pictured below. It was absolutely delicious! You could really taste the difference with the organic vegetables and pesto. The fresh flavours really came through just like the flavours of the coffee enticed my taste palette earlier in the morning, and inspired me to cook with fresh produce. It was so worth the trip early in the morning. As it was a lovely warm evening, I took advantage of my terrace and ate al fresco. It was such a fabulous meal and I am so glad I finally managed to find some time to visit Borough Market as it exceeded my expectations and I had the bonus views of Tower Bridge. 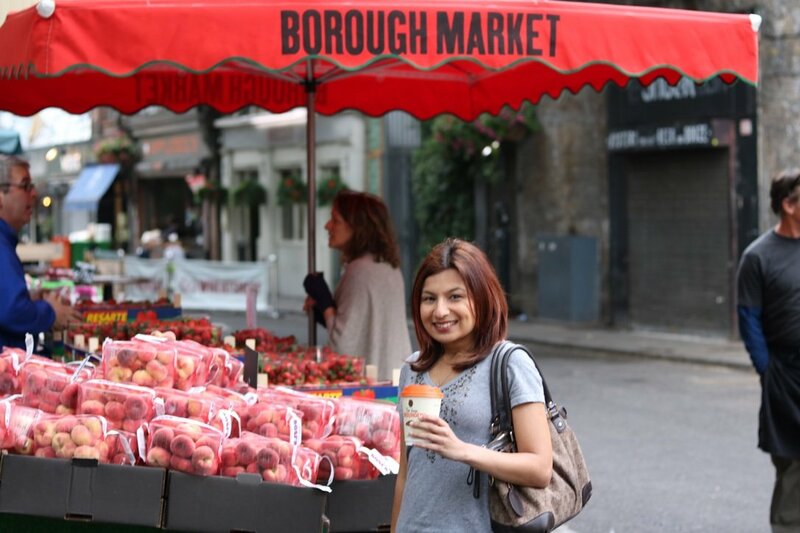 It is amazing how much you can fit into your day by saving time and the Nestle Nescafe Azera Coffee To Go really enabled me to tick visiting Borough Market off my bucket list. The cups have shaved off considerable time in my mornings allowing me to make time on other days to blog, or simply read a book to relax – something which I have really struggled to do because of my busy work and blogging schedule. What I love most about the cups, aside from the convenience, is the taste of the coffee. It has a premium taste, is full flavoured and intense – just like the instant coffee tins from the Nestle Nescafe Azera range. Are you a coffee lover but struggle to find time for the things you want to tick off your bucket list? Try the Nestle Nescafe Azera Coffee To Go cups and use that spare time to experience new and different things. The feeling of accomplishment afterwards is immense. I will be sharing photos of my day at Borough Market on Instagram so look out for the hashtag #NescafeAzera. In addition, I will be collaborating with Nestle Nescafe Azera Coffee To Go for an Instagram takeover of my daily quotes so make sure you check my quotes out early morning each day with #NescafeAzera. Disclaimer: This is a sponsored post in collaboration with Nestle Nescafe Azera Coffee To Go. However, all views and photos are my own. Next Post Mushrooms sautéed in Garlic on toast and some tips on relaxing and taking some time off. Thanks lovely!! I have been trying to comment on yours but the comment box is not loading up for me :/ will try later but in summary LOVE the post!!! Great post Binny – love the video!